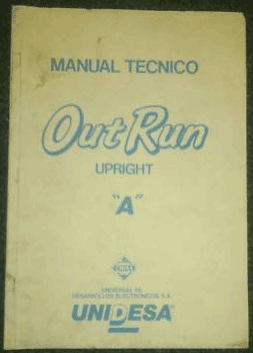 It's an OutRun arcade manual from a Spanish company called Unidesa (Universal De Desarrollos Electronicos S.A.) who seem to have licensed OutRun at some stage. The company still exists and has a website here. I expected it to be a straight translation of the common English Sega manual that can be found at KLOV. Whilst the manual initially does contain translations of the service tests and dip switch settings, it interestingly contains additional technical information not present in the Sega manual. Most importantly, it contains a fantastic diagram of the OutRun PCB, with all components labelled. If I had a scanner, I would scan these in, but for now I will simply list the additional pages. The diagrams are not hand drawn, like the English Sega manual. - Video board clearly divided into labelled components including ROM, RAM, Power Outputs and the explanations of what functions the other areas of the board performs. Each component is numbered. - Similar to the above. Divided into Main CPU, Slave CPU, Road Character Generator etc. - A superclear wiring diagram for the Outrun cabinet. This is far better than the Sega effort. Each wire leading into the PCB and other components is clearly labelled with its function and colour. There are also a couple of detailed technical pages about the Hantarex monitor, that don't appear in the Sega manuals including a nice circuit diagram. If anyone knows whether there was another manual to accompany this one, or has further information - please let me know. 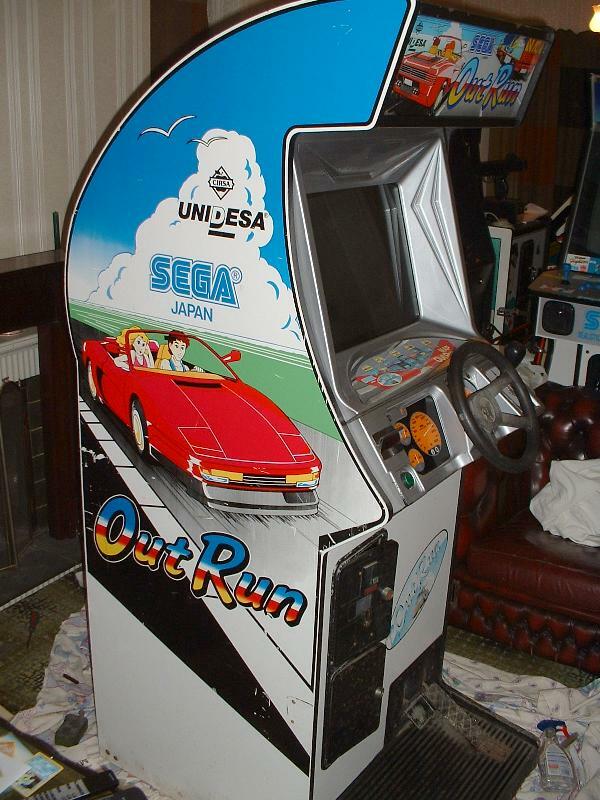 Update: Here is a picture of the Unidesa white OutRun cabinet, via the JAMMA+ forums. The PCB is different from the Sega version, which would explain the alternate diagram in the manual. The game uses the European track layout. I already have the Sega manual but I don´t find the unidesa manual at all, can you scan it? It seems be very useful. The Hantrax monitor information can be found online if you google. The PCB/wiring info will be the most useful for you, as the PCB is different from the standard European model. Maybe I can take a photo of this for you. Does your machine powerup at the moment? Hi, the machine powers up but I need info of how to fox the motor circuit (is cut), and the monitor chasis is missing so no video, but sound, pedals and stering seems to work. I don´t understand how a spanish manual of a spanish exclusive model is outside Spain. You will find the monitor manual there. Believe it or not, the chap who sold me this manual (from England) had to smash his machine up, as he couldn't find someone to take it off him. He kept the PCB, and a few other bits.